Cathy Ikeda @ Minding in The Middle gave me an award last week and I am so thrilled to receive this. Thank you so much Cathy. Anyone should browse to her blog. It is so cool to have another bookish blogger in on this blogsphere. 1. Put this on your blog, whether as an entirely new post like I'm doing, or on your sidebar. I made a research before passing this award and decided to pass it to a few people which not have this one yet. I hope I did my best. And if I miss someone or you already have this one, I'm sorry. I still love you, everyone! Congratulations on the amazing award! Congratulations on the award, Darlyn! I do have this one. I try and pass them on to people who haven't won them before too, but it's so hard to keep track, especially since there are so many different awards! First congrats on the award. You deserve it. Thank you too for choosing me to give this award to. I really appreciate it. Congratulations on your award!!! Also, thank you for thinking of me....it means a lot! Congrats on your award and thank you for thinking of me! Congrats on your award and thank you so much for passing it on to me. Congratulations on your award....you are so very well deserving! And thank you thank you thank you for thinking of me! I truly appreciate the award!!!! Congrats on the award and Thanks for passing it on to me! 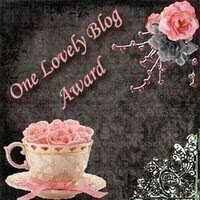 Your blog is awesome and you deserve it! Thank you for the award. I am flattered.